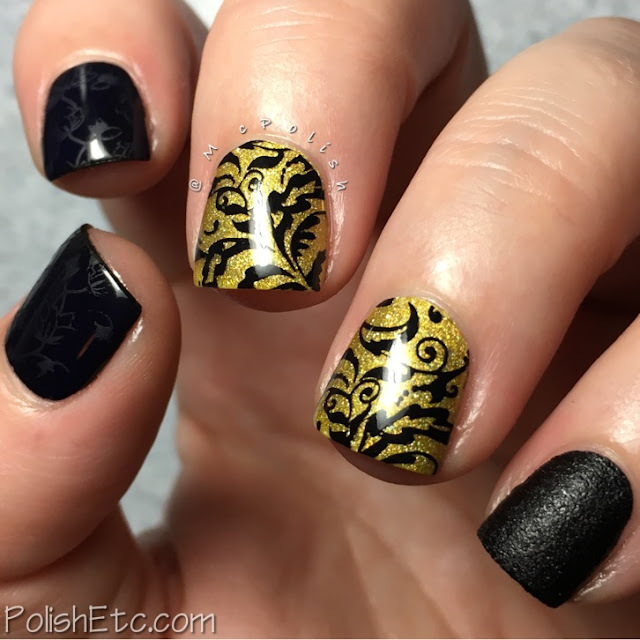 Inspired by Fashion for the #31DC2017Weekly - Polish Etc. Happy Labor Day to all my American friends! I hope you didn't have to work today. Even though I did not have to work today, I am spending the day catching up on work. It never ends! I am also catching up on the #31DC2017Weekly. Today, I have a nail art look inspired by fashion. Specifically, fashion outfits worn by Kit Harington and Rose Leslie at the Season 7 premier of Game of Thrones this summer. I love Game of Thrones so much and was in a bit of a depression this weekend because the season is over. So what better way to deal with it than to do some nail art inspired by the series. Kit and Rose are a real life couple that met on set playing love interests. How cute is that!?!? And...they looked great together a the premier. My manicure is a skittlette that brings both of their outfits together as one. Here is the photo that inspired the manicure. Rose is wearing a lovely gown in yellow with black embroidery. While Kit has on an embroidered black on black jacket with some Asian influence. Aren't they just too cute? To recreate this look, I did some stamping. For my Kit nails, I started with a base of Digital Nails "I See France" and a glossy top coat. Once that dried, I stamped over the glossy black with a satin top coat using the UberChic Far East-01 plate. 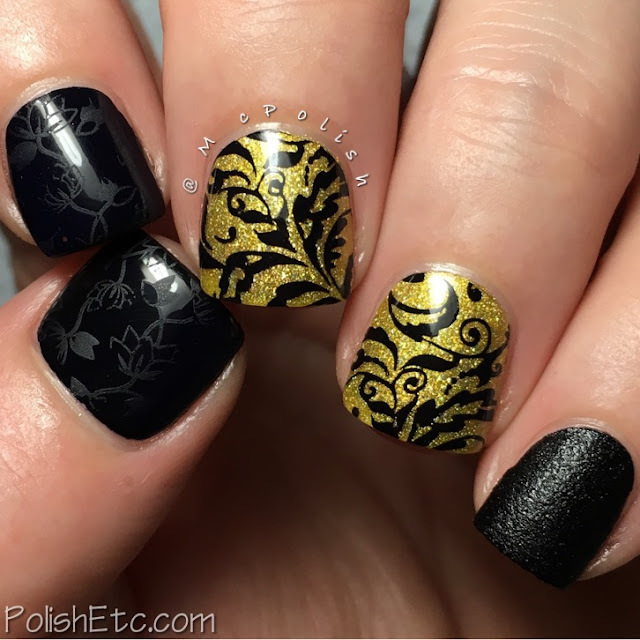 For my Rose nails, I started with a base of Masura "Limoncello (1038)" and stamped over it with black using the UberChic Plate 7-01. On my pinkie is just a little matte black texture using Nails Inc "Noho". After yesterday's nail fail, I am totally loving this manicure! I have not done many skittlette manicures this year like I usually have. This look reminds me how great they are. I need to find time to do more of them! 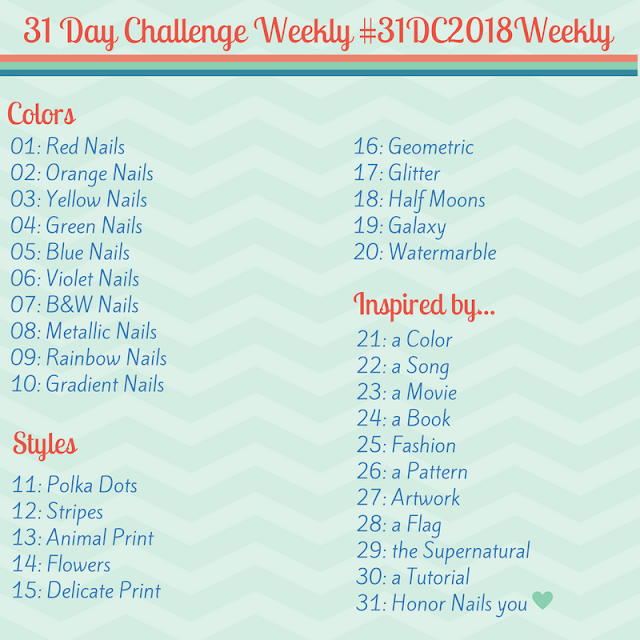 Only a few weeks left in the challenge :) Be sure to check out the tag #31DC2017Weekly tag on Instagram, Facebook and Twitter.